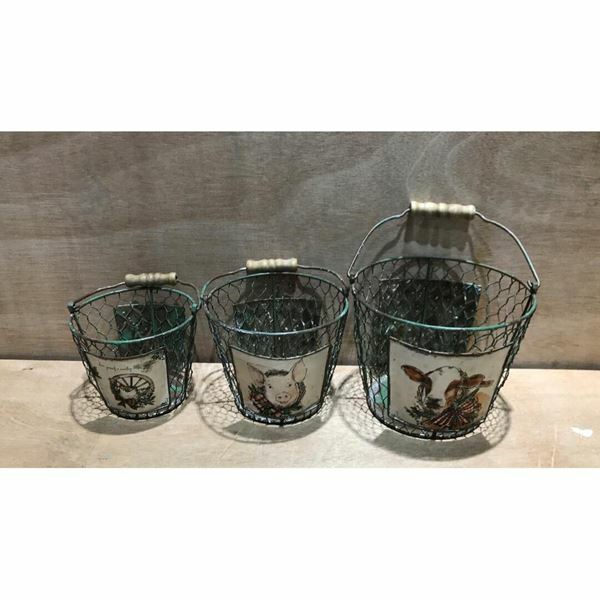 Bring some farmhouse charm to your home with the Set of Three Metal Farm Animal Baskets. These baskets combine chicken wire construction with a distressed green finish and three adorable illustrations of a cow, a pig, and a chicken. A handle with a wooden grip completes the look. Bring some farmhouse charm to your home with the Set of Three Metal Farm Animal Baskets. Set of Three Metal Farm Animal Baskets. Set of three wire baskets.